Rocky Rex's Science Stuff: Climate Change - Have humans caused climate change for longer than thought? Climate Change - Have humans caused climate change for longer than thought? Lead researcher Associate Professor Nerilie Abram from The Australian National University (ANU) said that their study found that warming began during the early stages of the Industrial Revolution. Warming is first detectable in the Arctic and tropical oceans around the 1830s, much earlier than scientists had expected. CO2 information from ice cores shows that atmospheric CO2 levels began to rise from around 280 ppm as the 19th century began. 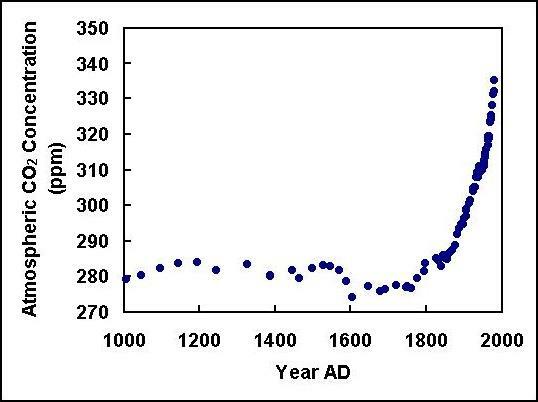 Atmospheric CO2 concentration over the last millennium, as reconstructed from ice core data obtained by Etheridge et al. (1998) at Law Dome, Antarctica.